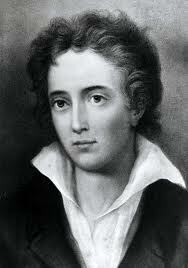 Percy Bysshe Shelley (1792 - 1822) was an English poet, essayist, and novelist. Despite his legacy today as one of the world's finest poets, his radical ideologies kept him from achieving acclaim during his short life. His atheistic beliefs got him expelled from Oxford and ostracized from his family, his adulterous ways cost him custody of his children, and he was plagued with discord and tragedy throughout his life. Even so, Percy managed to enjoy several close friendships, most notably with fellow poets Lord Byron and John Keats, and was able to travel extensively throughout Europe. He drowned at the age of twenty-nine in a storm at sea; many believe he was murdered, while others suspect suicide. Percy's second wife, Mary, was the author of the novel, Frankenstein, created in response to Byron's challenge to a circle of friends to write a ghost story.